The May Maine morning was hotter than expected, near eighty by ten o’clock. 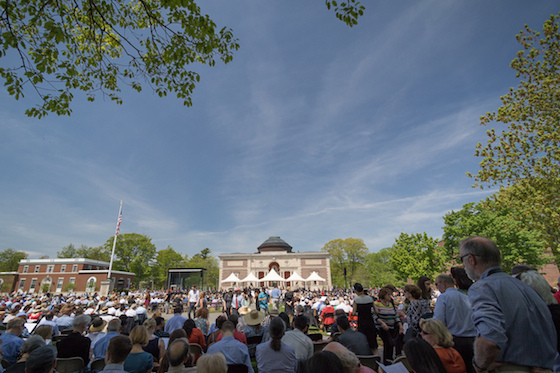 Nevertheless, I took my son by the hand to go watch some of the commencement ceremony, in which Michael was reading the names of some of the graduating seniors. When Calvin walked from home all the way to the college quad, albeit begrudgingly at times, I thought it might be too good to be true; he’s only accomplished that a handful of times. Once there, we perched on a grassy knoll in the shade of an old brick dorm, and gazed out over a crowd of students and parents melting in the heat. As I fed Calvin grapes, a woman approached with her young son. She took off her sunglasses and reintroduced herself to me, reminding me that we’d met at the grocery store some months back. She expressed her interest in my blog, then said a soft hello to Calvin, whom she’d never met. We chatted a bit about our boys, about school, about the college—her Alma Mater—and about living in Maine. I told her that the move from the West coast, specifically San Francisco, had not been a seamless one for me, noting that something about the Northeast feels slightly oppressive compared with the wide blue open of the West, but then adding that Calvin might be a main ingredient. In time, Calvin became restless, so I took his hand to venture home when I saw a familiar face, our dear friend Macauley. He came over, gave me a hug and offered to walk us home. I showed him a secret way to our house, past the college’s organic garden and through a narrow field. Stepping between trees into our back yard was like stumbling into an oasis, splashes of pink, scarlet, lavender, milky yellows, and white petals floating in a fragrant sea of lush greens. At that moment, I realized that having this garden—creating it the past twelve years—has aided in my transition. Calvin’s afternoon, while not his worst, was peppered with manic outbursts, stubbornness, tantrums and a refusal to drink or eat. I’d noted in his journal his restlessness, agitation, crying for no known reason, and his rashy skin, adding, seizure coming. Though asleep, all night our boy was unsettled and seemed in some discomfort. The room was hot, so we opened a window to let the breeze brush past his skin. Sometime after two a.m. I dreamt of Calvin seizing while I was cradling him. I couldn’t lift him off of me to get his rescue medicine, so I cried out in vain to the others who were sleeping in the room, “Calvin is having a seizure!” Michael woke me from my nightmare, but sleep soon returned me, and I went on to dream of a bruised big toe which he'd broken during the fit. Twenty minutes later, at three o’clock, I was awoken again, this time by Calvin’s wretched seizure scream. I followed my recent protocol: put frankincense under his nose and on the bottom of his big toes and applied pressure to the balls of both feet. When the seizure stopped I gave him his morning benzodiazepine three hours early and chased it with drops of water. Then we changed his diaper and watched him fall back to sleep. Even so, my efforts failed to prevent a subsequent grand mal some hours later, for which I administered rectal Valium. It took a while for the drug to work, during which time my boy convulsed quite violently in his bed. Afterward, I wondered if I’d pushed Calvin too hard in the heat that day. I wondered if I should’ve given him extra cannabis at midnight. I wondered if there was a low-pressure system moving in, wondered if we’d be headed to the hospital again. And then I fell back to sleep thinking of those graduates, some of whom remind me of how Calvin might've been. I drifted off thinking of our wonderful network of friends and supporters, thinking of the closeness of the heat and the budding of the trees and shrubs in my oasis, and thinking of the pride I feel or an odd little boy who will never go to college, but who walked with me beyond his comfort zone, out in the wild blue open, which is more than a lot of people can say.